Whether you’re the type who carefully maneuvers around them or just happily drives through, potholes are nobody’s idea of smooth sailing. Apart from causing damage to vehicles – in some cases, BIG time damage – they’re a nasty road hazard. And, the longer you leave them, the more they deteriorate. Without getting too technical, potholes are created when moisture penetrates through the asphalt of car parks, driveways or road, via cracks in the surface. Water then begins to pond and then slowly penetrates through the cracks, pushing the pavement upwards. 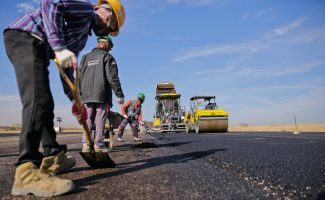 With traffic, the pavement will then break and collapse into a void – and this is when we have a nasty, gaping problem that only gets worse – if left – as the asphalt breaks down further. If you’re a business owner with a shopfront or your organisation manages a public car park, throwing in the added complication of getting sued adds another crack in the ‘wait and see’ approach. If you’re a homeowner, a small problem in your driveway can rapidly turn unsightly, lowering the value of your property while putting the ‘crumble’ into ‘humble abode’ by visually diminishing your home’s appeal. Pothole repairs sometimes become necessary during the lifespan of an asphalt surface, which can be up to 20 years. But, the ideal time to act is sooner than you might think – when the first signs cracking or deterioration appear. Make your potholes whole again – which road to take? Depending on their size, potholes can either be filled or cut out and fully replaced. If the surface is less than 20mm, the repaired surface must overlap to allow the old and new surfaces to bond together. 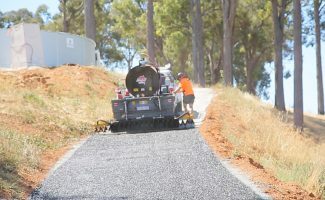 If the existing surface is greater than 20mm, the existing asphalt needs to be cut out and filled with new asphalt. Sounds complicated? 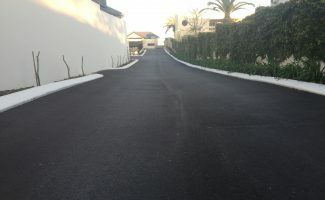 Luckily, we at All About Bitumen and Asphalt specialise in such procedures. And, once your car park or driveway repair is complete, we’ll even remove all sand, rubble and rubbish from site just like we were never there. We’re masters at turning holes into whole. Read about our car park maintenance and driveway maintenance services and contact us if you have further questions.